Every year for her birthday and Christmas, one of the gifts I get my mom is a new Chicken Soup for the Soul book. She is always super excited to see which one will be added to her collection and she can't wait to start reading it. This year she will be receiving Chicken Soup for the Soul: It's Christmas! Christmas is an exciting and joyous time of year, a time of family, friends, and traditions. You will delight in reading the 101 merry and heartwarming stories about holiday traditions, family, and goodwill. Remember, all our stories are “Santa safe” so they can be enjoyed by the whole family. Chicken Soup for the Soul: It's Christmas! is a collection of 101 festive holiday stories will warm readers’ hearts and spread the wonder of the holiday season with its tales of love, joy, and awe. 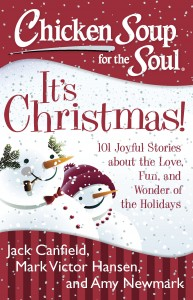 Chicken Soup for the Soul: It's Christmas! 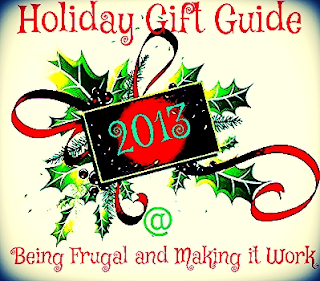 makes a fantastic holiday gift and is the perfect way to start the holiday season! "Chicken Soup for the Soul has become synonymous with comfort, compassion, contribution and the things that bring us happiness in life. Whether you’re single or married, looking to make a life change, coping with a hard time, or just need a little piece of comfort, Chicken Soup for the Soul gives you just what you need. No matter where you are in your life, Chicken Soup for the Soul is always there for you, changing the world one story at a time." This giveaway will end December 10th at Midnight EST. Disclaimer: The Being Frugal and Making it Work family received a complimentary copy of Chicken Soup for the Soul: It's Christmas! for the purpose of writing a review and hosting a giveaway. Regardless, I only recommend products or services I would use personally and/or believe will be a good fit for my readers. The views and opinions expressed on this blog are based purely by our own experiences. No monetary compensation was received. Results may vary. I like Christmas because of the family getting together. I like Christmas because of the joy and happiness I see on my nieces and nephews with the anticipation of Santa. I love Christmas because of the meaning of the season. I love Christmas because I love spending time with my family. And I love creating new traditions and memories with my kids. The other Chicken Soup for the Soul book that I would love to read would have to be the Chicken Soup for the Soul: Think Positive for Kids book. I love sitting and discussing books and their contents w/my kiddos. I love Christmas because it is the day my Savior was born and I am so very thankful for that. It is also another opportunity to share w/my kiddos about the birth of Christ. I would love to read Messages From Heaven. I love stories like that. I am beginning to like Christmas more now that I am a little older. It has become so commercialized, but after deciding to make things simple, I now enjoy the true meaning. I love Christmas because I love spending time with my family and seeing the excitement on my kiddos faces Christmas morning! I would love to read Chicken Soup for the Soul: Just Us Girls also, looks very good! There are so many I like :)One I'd like to read is Chicken Soup for the Soul: O Canada The Wonders of Winter. I love Christmas because people tend to be in better spirits and are more giving and helpful this time of year. I would love to read Chicken Soup for the Soul: The Magic of Mothers and Daughters. With daughters of my own, I think I would find it very uplifting.